It was a sour taste left in the mouth of a few Nike Cross Nationals aficionados last year that gave birth to the Inaugural Nike Valley Twilight Invitational. After being touted as one of the top three NXN regionals much of the year, the Midwest Regional was expected to draw several boys and girls at-large bid respectively. It did not receive any bids. One of the goals of this new event is to present a quality event with more sets of eyes on potential at-large candidates down the road. In the case of the activity itself, a solid number of teams from several states which included Ohio, Illinois, Missouri, and Indiana ventured to Indiana State University to compete on the LaVern-Gibson course. The pre-meet favorite, Beavercreek, is quite accustomed to competing in twilight meets. The Beavers recently won the high stakes Centerville HS Twilight meet in an upset manner over some great squads. They would pit themselves as the Buckeye state's #1 team vs. the best that the Hoosier state had to offer in Carmel. 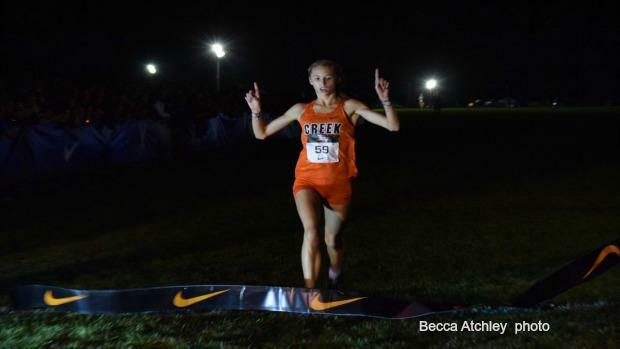 Beavercreek got out well and situated themselves near the upper packs and on the strength of top runner junior Taylor Ewert's impressive 17:26 win. More importantly, it was the strong closing finishes by junior Jodie Pierce (2nd), junior Savannah Roark (5th), and sophomore Juliann Williams (10th) that allowed Ewert to linger near the finish line to support her teammates. Despite a strong onslaught by Carmel who used 3,15,17, 22, 27 and even 29th placings to try and displace the Beavers, the Lady Greyhounds still came up short in the winners circle 59-84. Junior Phoebe Bates led the way with a time of 17:56. With the state series upon Carmel, it was important to send a message to third place Indy Brebeuf that a potential state title for the Braves will have to go through the Greyhounds. Individually, it was all Ewert after she darted away from a small pack just past the first mile. In the clear, Ewert hit the second kilometer in course record pace but slowed at 3k in 10:20. Finally, with the victory in sight, Ewert threw up the victory sign as she crossed the tape and finish line in one of the fastest times in course history. Ewert, already a premier threat on the national racewalking scene is now equally dangerous on the cross country course.